Motivation is an Emotion : Motivated.us your motivation daily. ..and I really felt it. Recently I was turned down by one of my close friends (yeah yeah I know) and it’s been really bugging me to the point of distraction. I had a horrible dream this weekend where I basically wasted my years in college, got a terrible job, lost all my friends and family. It was miserable. When I woke up, I had this feeling of wanting to work. To do well in school. To be excellent. After awhile the feeling went away and I’m having trouble remembering what it felt like. But I felt it. And it felt good. Really good. 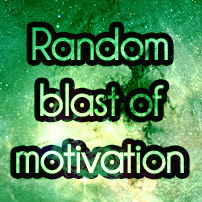 Like the Intro to Motivation in the side bar said, motivation is an emotion that we can remember; I want to remember. And I know that I will again. edit: Just re-read this and it’s so sappy it hurts my soul. Here’s a video of someone being awesome.